My friend Barb Laedtke is such an interesting and generous friend. I’ve known her for 13 or 14 years now, but the longer I know her the more interesting I think she is. I am struck by her hospitality and her ability to have a conversation with anyone making whomever she is talking to feel genuinely heard and valued. She is a genuinely good listener and a wonderful hostess, so it is fitting that she has hosted several foreign exchange students in her home. I think she has always been interested in other places and awakened that interest in her children, sending her youngest son to Turkey and Hungary for an exchange. I could go on about Barb, and perhaps I will another day, but this past Saturday she introduced me to someone special. 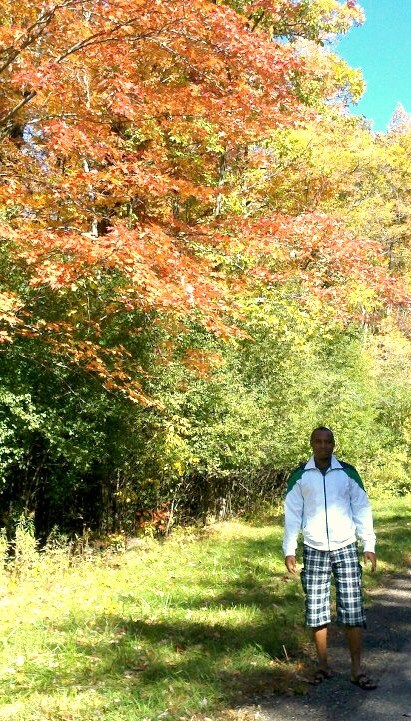 When I stopped by Barb’s house on a walk with Stella, I met me a lovely young man whom she is mentoring from Kenya. His name is Elijah Mutah, and he is here to study natural resources at Fox Valley Technical College in Appleton where Barb teaches English. When she introduced me, I wasn’t quite sure what to say to him. I am at times shy for no good reason, but it didn’t take long for me to begin asking him questions when I found out he works with lions and elephants in Kenya. His government sent him here to learn more about conservation and protecting natural resources. As we were talking, Elijah told me a story about elephants he has seen. I mentioned I had heard elephants have strong family bonds. He said they do. In fact, he said one day he was with some other people out in the wild and came upon a mother and baby elephant. The baby had somehow gotten into a ravine and couldn’t get out. The mother elephant was trying to pull the baby out with her trunk while she braced one leg against the side of the ravine. Elijah said they were prepared to help had the mother not been able to get the baby out, but she succeeded. He said they were amazed that the mother would know how to solve that problem. As he spoke, I could picture the whole scene in my mind. I asked him what he thought about the United States since all I really know of Kenya is what I’ve seen in National Geographic magazine and gathered from the movie Born Free, which I watched repeatedly as a child. (By the way, Elijah has been to the site where George and Joy Adamson raised Elsa the Lioness.) His answer surprised me. He was amazed traffic flowed smoothly, and people actually obey the traffic signals. He says the traffic in Kenya is terrible. There people need to leave their homes two to three hours ahead of time to arrive at their offices on time and leave two to three hours ahead to arrive home at a reasonable hour as well. Although he doesn’t live in a city, he lives near the fourth largest city in Kenya, Nakuru. There is a large wildlife refuge near there on Lake Nakuru. He also couldn’t believe how beautiful and unusual (for him) our fall colors are. Kenya is on the equator, so they don’t have the change in seasons we do. He told me he had never before seen a yellow tree. I hadn’t thought of that before. I think sometimes when we live day-to-day with beauty, we sometimes don’t see it. I had been walking that afternoon and noticed the reds and golds, but they hadn’t inspired in me the kind of awe he experienced that day. On the walk home, however, his awe for the spectacle that is autumn here in Wisconsin allowed me to see my world anew. Barb is a great friend, and since I’ve known her, she has introduced me to unique and varied people. She has expanded my world as she has the worlds of the exchange students she and her family have hosted and mentored. Barb introduced me to this wonderful young man, Elijah Mutah who opened my eyes to the wonders of my world and told me about the wonders of his. I hope to see him again while he is here in America and perhaps one day go to Kenya so he can show me his lions and elephants. Perhaps I can inspire in him the same newness of experience he shared with me. Thank you, Barb and Elijah. Thanks, Debbie. I’m glad you enjoyed reading. Thanks for taking the time to check out some of my posts!